Further to my letter in June, I am writing to advise that work to apply a new paint system to the footbridge which crosses over the A404 near Marlow, has been postponed by four weeks. The first weekend closure to remove the footbridge is now scheduled to take place from 9pm on Friday 31 August to 5am on Monday 3 September 2018. During this period we will need to close the A404 north and southbound carriageways, between the junction with the A4155 just outside Marlow and the Bisham Roundabout. In addition we will need to close Parkway (which runs parallel with the A404) from 9pm on the Saturday through to 6pm on the Sunday. The second weekend closure to reinstall the footbridge is still planned from 9pm on Friday 12 October through to 5am on Monday 15 October 2018. Delays are expected during these weekend closures, and we advise that you plan ahead of your journey to allow extra time or avoid this route where possible. 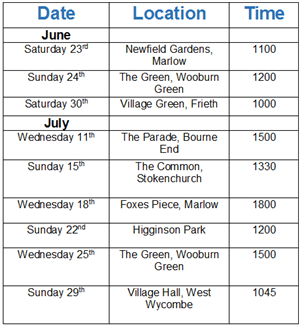 The Marlow Neighbourhood Team are going to be running Pop-Up Police Stations throughout the summer in various locations across our communities! This is the perfect opportunity for people to speak to us about any concerns they may have and get to know the local officers. We will also be giving out crime prevention advice and on some occasions marking property for free. Below are the places we will be throughout June/July. Please click the link below to find more details from Highways regarding the M4 works.